Rotator cuff tears can result from trauma or without trauma. In patients over the age of 60 years, it is not uncommon to have rotator cuff tears develop gradually. 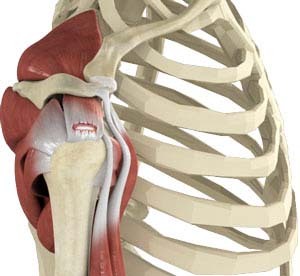 The rotator cuff has a poor blood supply and with time it begins to degenerate. On the other hand, traumatic rotator cuff tears are usually from an injury, such as a fall, motor vehicle accident or injury at work. Rotator cuff problems may also arise from repeated use of arm for overhead activities, while playing sports or during your normal day to day activities at work or home. Rotator cuff tears cause pain (particularly at night), and weakness of the arm. Most patients experience pain down the side of the arm (over the deltoid), but it is not uncommon to have pain traveling up to the side of the neck as well. Dr. Patel diagnoses rotator cuff tear based on the physical examination, X-rays, and imaging studies, such as MRI. Rotator cuff tear is best viewed on magnetic resonance imaging. Dr. Patel performs rotator cuff repair surgery via arthroscopic portals. In arthroscopy, a few small portals are used to access the rotator cuff tendons which will be retrieved and repaired using suture anchors. These anchor sutures help in attaching the tendons to the shoulder bone. Following the surgery, you will be in a sling, but may be advised to practice motion and strengthening exercises.